Why am I an advocate for the blind and visually impaired ? 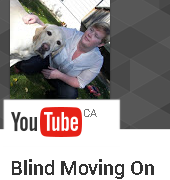 Why have I made it my full time job to write this blog and put up YouTube videos about blindness ? I am passionate about change and making sure that the next generation wont have to fight as hard as we do now and have in the past. I want accessibility to be in the front of the minds of every person in the world. I want children in school to not have to fight for the things that they need to have an education on the same playing field as their non-disabled class mates. I want people to know that accessibility is not a privilege but a basic human right. You would never accept people being denied jobs or meals in a restaurant for being a red head or for wearing glasses, so the fact that so many people do not know these things happen to people with disabilities says that I have lots more work to do. More than wanting to help change the perception of disability, I want to show the kids and people new to vision loss that blindness does not need to stop you. You can decide what you want for your life. I hope that in the work that I do I can help just one person view their blindness in a positive way then I am happy. I was thinking the other day that I haven’t accomplished much this year and then my husband reminded me of everything that I have done. I am not someone to highlight what I have accomplished but I think that it may also help someone to know what they are capable of. So here is a general list of the things that I was involved in this past year. I do not tell you these things to pat myself on the back, I tell you these things because I want people to know that no matter what they want to do they can. I have had a sad day today as I took Rick to the vet early this morning to have surgery. He has broken a tooth and needed to have it removed. I was so sad this morning when I woke up and the day to take him in was here. After I began getting ready I realized that I would not be able to work Rick to the vet this morning as I use food reward and he could not have any food or water this morning. So I thought it would be better for him to just walk on leash but this meant that I had to use my White Cane. I have not had to use my cane all that much since I have gotten Rick. As I was getting ready I started to feel this anxiety and worry creep up on me. I found myself really in a state of panic and anxiety, just like I used to feel every time I left the house. This was not something that I talked with many about, mainly just my O and M instructor. I would never not go somewhere because I was nervous or anxious but it really could take a hold of me if I was not careful. This was one of the main reasons that I chose a Guide Dog I hated the feeling I got every time I left the house. I hated having to run into things to find them or miss things that I was looking for like a pole for a bus stop, or a doorway to the coffee shop, the low hanging branch that smacks me in the face, the puddle that soaks my shoes. I wanted a better way of travelling alone. When I was gifted Rick my life as I knew it changed, the confidence I felt when I left the house was amazing, the independence I had increased even more. The way I had wanted to travel was finally a reality. I am very aware that having good cane skills is essential as there are times like these when you are not able to work your guide dog, and there is going to be a point where you may have to retire your dog. You need to have options for getting to where you want to go and doing the things in life that come up. There is nothing worse than needing to rely on others to take you where you want to go and needing to be guided around. This is something that I need to work on and conquer so that I don’t have this anxiety when I have to travel with a cane. This can be done, it will just take some work. I know what I am capable of and the independence that I want. I also will make sure that I have that level of independence and confidence in all aspects of my life. For those of you that are wondering, Rick is home and doing good. He is still a little dopey and we are just waiting for the anesthetic to ware off and recovery to start. Cuddles make everyone feel better !